Also known as a breaker box, electrical panel, fuse box, or load center, your service panel is the heart of your electrical system. It connects the wires from the outside power grid to your home’s electrical system and controls all of your home’s power. In order to safely and efficiently power your home, it’s crucial to maintain this panel. Of course, if your service panel is outdated, you may want to consider a main panel upgrade from the professionals at Chesapeake Electric. Chesapeake Electric has been providing first-rate electrical contracting services to the Annapolis area for over 10 years. We’re locally owned and operated, and take pride in supplying superior craftsmanship and customer service. If you need more power supplied to your home but your service panel isn’t up to the task, call us for a free consultation and we’ll have one of our certified technicians out to you before you know it. Why would you need a main panel upgrade? If you’re like most people, you probably place a priority on protecting the safety and value of your home. A service panel upgrade is one of the most important things you can do to resolve current issues and prevent overloads and shorts that may even cause a house fire. 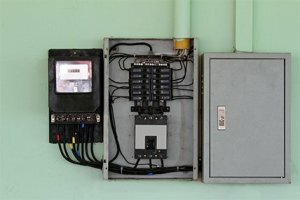 In addition to the safety aspect, upgrading your service panel will do wonders for providing your home with an efficient and consistent supply of power that may also lower your electricity bills. An upgrade will even allow you to add additional circuits to your home, so you can go ahead and install those extra outlets you’ve been wishing you had. Once you’ve scheduled a main panel upgrade with Chesapeake Electric, there are a few things you can expect. First, we’ll obtain the necessary permits and make all the necessary arrangements with your power company to perform electrical work at your location. On the day of installation, we’ll send a certified technician out to your home or property. The exact process will depend on many factors, such as your existing panel and wiring, accessibility, and the replacement panel to be installed. Before the new panel is activated, it will undergo a thorough inspection and approval process to ensure the job was completed successfully—and most importantly, to the highest degree of safety. Whether you’re bringing your electrical system up to code or simply upgrading for the sake of safety and efficiency, our team of licensed and certified technicians is standing by to deliver the quality service you deserve at a rate that won’t break the bank.